Yes, I know it's not New Years Eve, but that doesn't mean we can't celebrate like it is. This weekend has been busy and overflowing with sweet moments. I am a lucky girl. We got tiara's with flashing multi colored lights on them, top hats, noise makers, and bubbles. We posed for pictures like we were at a high school dance. We watched other people sing their hearts out at karaoke. We forgot we were at an event sponsored by work and we relaxed and had fun. 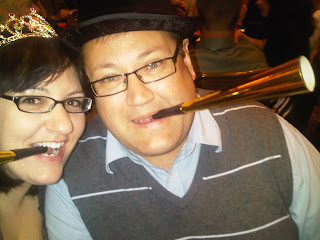 I even wore my tiara, flashing lights and all, around the casino. Thank you to the girl working the concession stand at the theater who told us that the bottled water was really expensive but she would give us a glass of water for free. I'm thankful for the comfy bed that allowed me to get a good nights sleep so that I would be well rested able to make it to church on time this morning. I got to hear Brylly say my name for the first in the middle of the church service today. He may have said it before, but this was the first time I got to hear it!!! Thank you to the Ameristar employee working at the dessert table who didn't question me when I decided I needed a piece of chocolate pie AND a brownie to finish off my .... breakfast. Thank you to lady who told me I looked pretty in my tiara. I'm thankful for the cool weather that made the long walk to our car a littler easier this morning. Thank you to whoever decided that catfish and fried okra were appropriate buffet items at 9am. I really didn't want to eat french toast or pancakes. I'm thankful for Mom, Dad, and Levi for dog sitting Mya so we could go away for the night. Thank you to Maggie for keeping us entertained during the down times last night. Thank you to Ikon for providing us with a reason to get dressed up and have a date night. Thank you to my wonderful husband for loving me so much he is still willing to hold my hand in a crowded casino when I look like a preschooler playing dress up with a flashing tiara on my head and a noise maker in my mouth. I am a lucky girl to have so many wonderful things to be thankful for. you are so much better at spotting the sweet moments than me. If that had been me I probably would have only said thank you for the money and yummy food! !